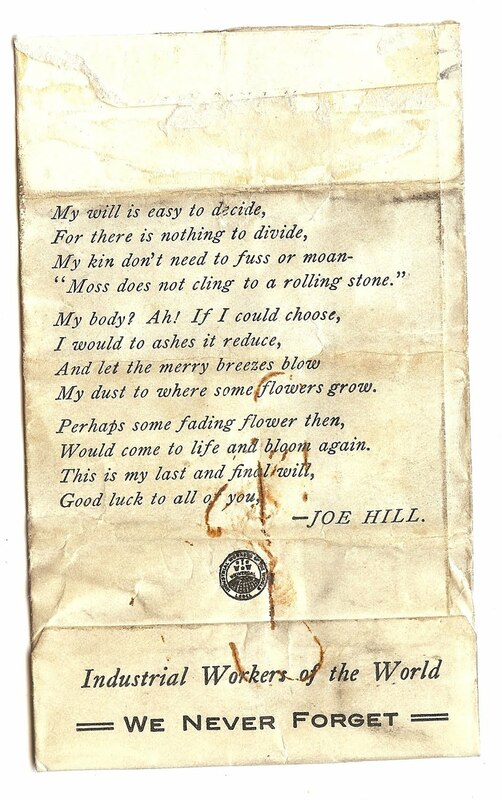 Anyone who is a fan of Billy Bragg, as I am, or Bruce Springsteen, Bob Dylan, Pete Seeger, Woody Guthrie or the sixties protest singer Phil Ochs knows that radical America’s greatest songwriter-educator Joe Hill is still alive in the young-in-heart on this besieged Labor Day. Joe, a Swedish immigrant and wandering troubadour-troublemaker, was a “Wobbly”, an agitating member of the One Big Union, the red flag International Workers of the World, a harum-scarum, mad-as-hell, happy-in-fellowship bunch of hoboes and gypsy workingmen who scared the pants off business leaders, pious church-goers, police chiefs, governors and all right-thinking citizens in the early part of the last century. In my house, wherever we moved, my mother always put up two pictures, the labour lawyer who once defended her, Clarence Darrow (after whom I’m named), and the seditious martyr Joe Hill. As Joe may have shrewdly deduced on his last day, when the guards came for him – and a possible reason why he refused to testify for himself at his rigged trial – he may have been more valuable to the movement as a bullet-punctured corpse than he would have been alive: a reminder that the class struggle for which he was surrendering his life was – and is – as undying as his legacy on this Labor Day, 2011. Joe Hill’s IWW believed in head-on, confrontational direct action based on what we now fashionably call participatory democracy or self-management. Hence, you rolled into town in a box car and met spontaneously with other bindlestiffs and bums like yourself, and did what had to be done on a voice vote and no Roberts Rules of Order. You struck industrially, sabotaged when appropriate, and constantly tested the limits of free speech laws. Arrested en masse (and beaten, sometimes lynched), you whistled for your socialist, anarchist, what-the-hell comrades who poured in from all corners of the United States to fill the Podunk jails where you drove the sheriff and his deputies nuts with your tactics. One of which was to jump up and down in the jailhouse in unison until the flimsy wood structure broke apart around you as in a Buster Keaton movie. The IWW was unique in its time for admitting African Americans, illegal immigrants, Asians and women – an inclusiveness that was revolutionary in its day. That’s when labour really sang. Before Lieber and Stoller, before Irving Berlin and Tin Pan Alley, there was Joe Hill, who would, when the spirit moved him (usually in a bar or doss house), plunk-plunk a tune on his guitar, often a witty takeoff on a religious hymn or a current popular ditty. His verses, like “Rebel Girl”, “There is Power in the Union” and “Casey Jones: Union Scab”, soon included in the IWW’s bestselling ten-cents-a-copy Little Red Songbook, became for workers – all over the world – their version of platinum. Wherever “wheat bums” (migrant farm workers), miners, railroad stiffs, dockers and sailors, the unemployed and hungry gathered, they sang their hearts out from the Little Red Song Book. To “be union” was to sing songs at the top of your voice; melody, Marxism and militancy were braided into One Big Union. Labour today doesn’t have much to sing about. Organised labour – organised into structured unions tied to collective bargaining contracts, that is – is on the ropes. By all indices, Americans are working harder for less money – that is, when they are working at all. Unemployment and under-employment numbers at anywhere from 25 to 30 million, and the angry, unorganised jobless have yet to fight back except for the self-destructive manifestations of frustrated rage. Republicans in Congress hate the unemployed. If they could, they’d get rid of unemployment insurance altogether, which GOP minority whip Jon Kyl sneers at as a “disincentive for them to seek new work”. Kyl and his Republican and Blue Dog Democrat colleagues – direct descendants of Gilded Age barons who ordered workers shot down – with an enabling President Obama, who hasn’t lifted a finger to help unions he once promised to meet on the picket line, have united to declare old-fashioned class war on working people. Joe Hill and his spirited IWW comrades like the “rebel girl” Elizabeth Gurley Flynn, anarchist Emma Goldman, Big Bill Haywood and Gene Debs would immediately get it. The same victims, same union-busting tactics only now with $1000-per-hour billable lawyers: and the same enemy. At its peak, the IWW could count on half a million supporters in the US. Today, albeit in the thousands, in the US, UK, Australia and Canada, they’re the fighting young, between ages 20 and 30, with websites and strong hearts. And they’re organising – New York immigrant food workers, panhandlers in Vancouver, Chicago bike messengers, City of London cleaners – even at your favourite Starbucks. You can’t kill the spirit of Joe Hill. 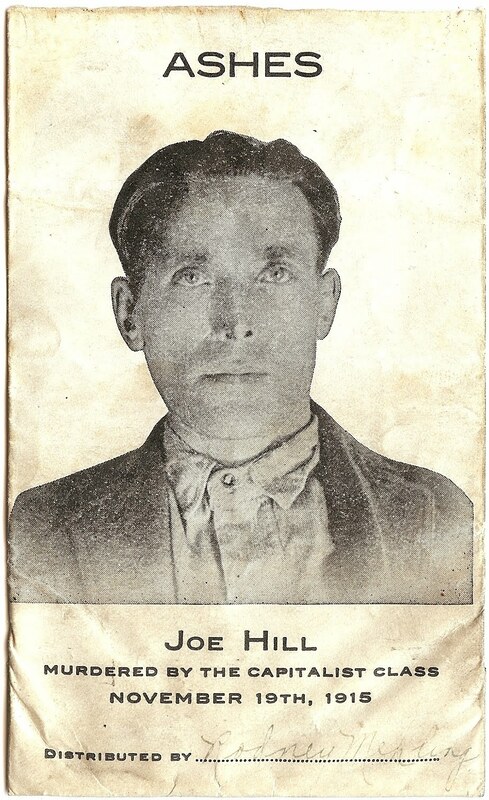 I enjoyed reading about Joe Hill. His song “The Tramp” probably had an influence on Charlie Chaplin creating his ‘tramp’. The humor of the words of this song is reminiscent of Rodney Dangerfield. For this tramp gets no respect from nobody. I made myself watch the Republican Debate 9/12. The hatred that some in the audience showed for immigrants was sickening. When Rick Perry was being asked a question about what should be done with immigrants, someone in the audience yelled out “Kill them”. Why is it that some people can feel such hate for other beings just trying to have and make a life for themselves? It was that sort of hatred that got Joe Hill executed. Fear and ignorance has made enemies of many innocent “goats”. I’m afraid it will take many more brave souls like that of Joe Hill to stand up again for the rights of the working stiffs of the world. To protect the weak and struggling masses, it would seem that the same battles for rights, once so bravely fought for, will have to be re-fought for over and over again throughout time.